10 Christmas: The secular vs. the sacred Can we celebrate Jesus and Santa on the same day? 27 Michael Foust | purposeful parenting 28 Kimberly Ruby | hereâ&#x20AC;&#x2122;s to good health 30 Joanne Brokaw | thatâ&#x20AC;&#x2122;s life! 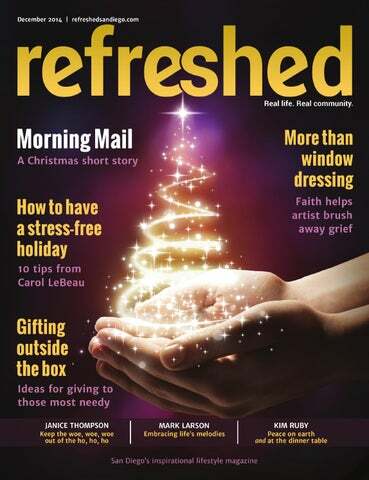 Download a digital version of Refreshed magazine for convenient viewing on your favorite digital device. CONTRIBUTORS Joanne Brokaw, Michael Foust, Jon Huckins, Daniel Jenkins, Mark Larson, Carol LeBeau, Dean Nelson, Kimberly Ruby, Janice Thompson ADVISORY BOARD Mark Rasche, Nelson Keener, Carl Schreiber, Brandon Ruby Copyright © 2014 Selah Media Group Refreshed is an independent, faith-based magazine published monthly by Selah Media Group. It is distributed in bulk, free of charge, to hundreds of locations throughout San Diego County. 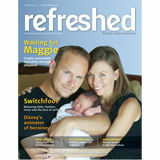 For a 1-year mail subscription, send $24.95 to the address below or visit refreshedmag.com. Refreshed welcomes story ideas. All unsolicited material is subject to approval of the publishers and is not returned. Viewpoints expressed in Refreshed are those of their respective writers, and are not necessarily held by the publishers. Reasonable effort is made to screen advertisers, but no endorsement of the publishers is implied or should be inferred. The publishers can accept no responsibility for the products or services offered through advertisements. The publisher reserves the right to refuse any advertising. that sent a solicitation in the mail. They rescue kids.” She lifted her eyebrows. “Isn’t that strange?” “Not for God, Selma.” Maggie smiled and lifted her eyes to heaven. Everybody’s expecting their best gifts tomorrow. I just got mine. ■ Mary Kay Moody is a free-lance writer with a passion for exploring life at the intersection of our plans and God’s purposes. If you stop by her website or blog, www.marykaymoody.com, sit a spell at the crossroads and chat. Merry Christmas, all. talk about how we will be giving them away to friends, family and people who need them. But, despite our best efforts, Christmas is associated with Santa Claus. Now, if it was the historical “Santa Claus” who gave away his best to save the lives of some children, that’d be awesome. But, no, this is the Santa Claus of consumption who promotes values of selfish acquisition rather than sacrificial giving. With all this being said—and as followers of Jesus—we have to ask the question, “Is it possible to celebrate Christmas and the birth of Jesus on the same day?” To begin to answer the question, we have to first understand that Christmas and Jesus’ birthday are not synonymous. In fact, historically, they really have nothing in common. Christmas as a holiday didn’t even come around for hundreds of years after the birth, life, death and resurrection of Jesus. As with many “Christian” traditions and holidays, it didn’t come around until after Constantine announced Christianity the religion of the Roman Empire in the 4th century. Its roots are largely pagan (like Easter) and it almost certainly isn’t celebrated anywhere near the time of year that Jesus would have been born in first century Palestine. Natureâ&#x20AC;&#x2122;s Answer to Addiction Addiction doesnâ&#x20AC;&#x2122;t have to be a life sentence. There is a natural detox method that can be done safely in the privacy of your own home. Heantos is a combination of organic herbs used to detox and eliminate cravings from opiates, methadone, and cocaine. Fast. Legal. Affordable. Safe. Effective. For more information, call Kevin Pender at (619) 672-9555. whole new way of living. A way that is marked much more by a cross than a noble fir with an angel on top. In short, the themes of consumption and selfishness run in direct contrast to the Kingdom inaugurated in Jesus. For us to celebrate the birth of Jesus, the holiday would have to look a lot different than it does in its modern, Western, industrialized iteration. Now that I have totally kicked your peppermint mocha off the balcony, lit a small fire under your Douglas fir and crushed my daughterâ&#x20AC;&#x2122;s hopes and dreams, let me ask again the question I posed at the beginning, â&#x20AC;&#x153;Is it possible to celebrate Christmas and the birth of Jesus on the same day?â&#x20AC;? Without hesitation I give a resounding, â&#x20AC;&#x153;YES!!â&#x20AC;? But not because itâ&#x20AC;&#x2122;s Dec. 25. Rather, because every day we are to celebrate the birth of Jesus through the way we live, love and lead in a way that embodies the values of a Kingdom whose King took the throne through offering the greatest gift of all; himself. With that in mind, I can release my daughterâ&#x20AC;&#x2122;s preoccupation with Santa Claus (maybe even celebrate it! â&#x20AC;Ś OK, maybe not), because the faith weâ&#x20AC;&#x2122;re inviting her to live doesnâ&#x20AC;&#x2122;t look like one day a year. It looks like 365. â&#x2013; Jon Huckins is the cofounding director of The Global Immersion Project, Missional Leadership Coach with Thresholds, family man, speaker and author of â&#x20AC;&#x153;Thin Placesâ&#x20AC;? and â&#x20AC;&#x153;Teaching Through the Art of Storytelling.â&#x20AC;? Follow his blog at www.jonhuckins.net. Acknowledge your feelings. If you’ve lost someone close to you or can’t be with loved one, it’s OK to feel sadness or grief. Have a good cry. Express your feelings. You can’t make yourself be happy just because it’s the holiday season. Reach out. If you feel lonely or isolated, look for community, religious or other social events. We all need support and companionship. Volunteering can help lift your spirits and make new friends. Be realistic. (This one’s key for stress control!) The holidays don’t have to be perfect—or just like last year. As families change and grow, move and marry, traditions and rituals often change as well. Stick to a budget. Decide in advance what you want to spend on gifts and food—then stick to it. Don’t try to buy happiness with pricey gifts. Some alternatives: Donate to charity in someone’s name. Give homemade gifts or start a family gift exchange. Plan ahead. I know. Easier said than done. But it works. Set aside specific days for shopping, baking, visiting friends and other activities. Make lists and work from them especially when it comes to menu planning. That’ll prevent last minute scrambling to buy forgotten ingredients. Learn to say no. Saying yes when you should say no can make you resentful and overwhelmed. People actually understand that you can’t participate in every activity. If you can’t say no when the boss wants you to work overtime try to remove something else from your schedule to make up for the lost time. Don’t give up healthy habits. Don’t let the holidays become a freefor-all. Overindulgence only adds to your stress and guilt. Have a healthy snack before holiday parties (this really works!) so you don’t go overboard on the sweets, cheese and drinks. You’ll feel better if you continue to exercise and get plenty of sleep. Take a breather. Make some time for yourself. Just 15 minutes alone can refresh you enough to press on this holiday season. Take a walk in the evening and stargaze. Listen to soothing music. Read a good devotional and meditate on it. Find something that reduces stress and clears your mind. Don’t be afraid to seek professional help. Despite your best efforts, you may find yourself persistently sad or anxious, plagued by physical complaints, unable to sleep, irritable and hopeless and unable to face routine chores. These are classic symptoms of clinical depression. I know from experience. These symptoms can be successfully treated. You can get back your peace and joy, whatever the season. So don’t let the holidays be something you dread. Take control. With a little planning, you may find you actually enjoy the holidays this year more than you thought possible. You really do have the power! ■ Carol LeBeau is a former 10News anchor, Staying Healthy reporter and current Health Champion for Palomar Health, avid runner, bicyclist and ranked, rough water swimmer. Learn more at www.carollebeau.com. Products and services featuring Christian-owned and operated businesses. for area businesses, recently completing an impressive 15-foot piece for Christian Community Theater’s summer production of Les Misérables, for which he also did set design work. His commitment to CCT is not limited to behind the scenes, as the entire family also acts with the troupe, including its popular “Traditions of Christmas” show. The couple also heads Heritage Christian School’s drama department, where Amber teaches high school art. “Since all of our kids are at Heritage, it was kind of an easy fit for us to do,” he said. Patrick Henry College introduces another reason to know us ... ECONOMICS & BUSINESS ANALYTICS A major preparing students to serve Christ in business and economics. The Economics & Business Analytics major is designed for students interested in pursuing: • An MA in Economics or an MBA • A career in business or entrepreneurship • A career in economic policy In the process, students will learn free-market oriented economics, advanced data and mathematical analysis, and essential business skills, all grounded in a strong liberal arts foundation that equips them for success in any ﬁeld. ment they make during the Christmas season,” he said. Gifting outside the box There are many local and international faith-based charities that provide non-traditional gift-giving opportunities worthy of our generosity. Here are several unique ways we can reach out to the needy in San Diego and around the world. he popular Holiday of Lights at the Del Mar Fairgrounds is taking its own holiday of sorts this year as the track undergoes turf renovation. The drive-through event with 400 themed displays and thousands of lights was a family favorite, drawing more than 100,000 annually. With the lights dark this year, families will have a great opportunity to try something new, perhaps finding an all-new Christmas tradition. San Diego County has plenty to offer to fill the gap. Perennial favorites are boat parades and the San Diego Zoo’s Jungle Bells. New to the mix this year, though, is the Holiday Wonderland at Petco Park, offering a wide range of Christmas themed activities. with the procession running from 5 to 6 p.m. A Piñata After-Party starts at the conclusion of the procession. Holiday Wonderland at Petco Park. Petco Park, on its winter hiatus from baseball, will host the Holiday Wonderland on weekends from 5 to 10 p.m. Dec. 5 to 21, with the added days of Dec. 22 to 24. The festival will include lighting displays, Polar Express trains, a Candyland, live reindeer, and photos with Santa and a 40-foot Christmas tree. Holidaythemed concessions and merchandise will be available throughout the ballpark. Admission is $15 for adults, $10 for children 3 and older. Children 2 and under are admitted for free. The San Diego Bay Parade of Lights, with its 80 or so festive boat entries, will sail past Shelter Island, Harbor Island, the Embarcadero, Seaport Village, and the Ferry Landing in Coronado beginning at 5:30 p.m. Dec. 14 and 21.This year’s theme is Children’s Stories. The parade starts at 5:30 p.m., advancing to prime viewing spots along Harbor Island, the Embarcadero, Seaport Village and the Ferry Landing on Coronado about every half hour. Balboa Park December Nights, formerly known as Christmas on the Prado, celebrates its 36th gathering during its Dec. 5 and 6 run. More than 350,000 people are expected at the festival, which runs from 3 to 11 p.m. Friday, and noon to 11 p.m. Saturday. During the event families will have free access to all Balboa Park museums from 5 to 9 p.m. each night. The multicultural experience offers food, music and entertainment from around the world. Del Cerro Baptist Church will also present its annual production of the Christmas Story Tree. “America’s Largest Balloon Parade,” The Port of San Diego Big Bay Balloon Parade, arrives to the bayside streets of downtown at 3 p.m. Dec. 26. Affiliated with the Holiday Bowl, the family friendly parade includes world-class marching bands, floats, drill teams, horse units and the event stars—dozens of giant character balloons. Viewing is free, though first-come, first-served grandstand seats are available for $20. Early parking is recommended. Guests near the television area will be able to see the finals of the 17th annual Wienerschnitzel Wiener Nationals and the Bumble Bee Seafoods 5K. The shores of Mission Bay light up beginning at 7 p.m. Dec. 13 with the Mission Bay Christmas Boat Parade of Lights. Sponsored by the Mission Bay Yacht Club, this parade begins at Quivira Basin and makes its way past Crown Point, the east side of Vacation Island or the west side of Fiesta Island. As many as 100 vessels participate annually. The Pacific Southwest Railway Museum—Campo Depot offers a new attraction with its Santa’s Toddler Train, designed for younger children who may not be able to stay up late enough for the now-sold-out North Pole Limited trains. Highlights of the Dec. 14 excursion include Christmas carols, snacks served onboard, a visit and photos with Santa and a scenic train ride through East County’s high desert. The train leaves the depot at 1 p.m. Tickets are $5 for toddlers on the lap of a parent, $30 for children 2 to 12 and $40 for adults. Christmas arrives early to Balboa Park with Jungle Bells at the San Diego Zoo, set for Dec. 13 to Jan. 4. Taking advantage of extended nighttime hours, guests will be able to board the Twinkle Light Trolley, view animal presentations and experience lighted animal sculptures on display throughout the park. Dr. Zoolittle’s lively version of “’Twas the Night Before Christmas” will be presented. Additional activities include carolers, the Toy Shop Hop trampoline acrobats, special music and entertainment, holiday treats and visits with Santa. Free with paid admission, though the trolley is $2 for children, $3 for adults. ■ Visit www.refreshedsandiego.com for many more Christmas events and a comprehensive calendar of events. SAN DIEGO — The San Diego Rescue Mission held a procession and candlelight vigil Nov. 2 to honor the 56 homeless people who died on the streets during a one-year period ending on Sep. 30. The 14th annual procession featured 56 people, each carrying a pair of shoes representing one who died. The procession stopped for prayers at various churches and ministry sites on its way to the County Administration Building. The mission holds the annual event to raise awareness of the county’s homeless, currently estimated at 8,900 men, women and children. LAKESIDE — Lakeside Community Presbyterian Church and its Joyful Noise Choir will present Vivaldi’s “Gloria” at 7 p.m. Dec. 12. The free concert will also include the choral ensemble, women’s chorus and chamber orchestra from the San Diego School for the Creative and Performing Arts. A free-will offering will be held. Learn more at www.lakesidepc.org or call (619) 443-1021. SAN DIEGO — Rock Church is seeking donations for its 18th annual Toys for Joy community outreach, which will be held at sites in central San Diego, El Cajon and San Marcos. Church officials are expecting 16,000 people to attend this year’s event. Donations of toys and clothing are needed. Along with a toy for each child up to age 11, families also receive clothing, groceries and meals for their entire family. Last year, Toys for Joy distributed more than 9,000 toys, 195,000 articles of clothing, and 8,700 bags of groceries. This will be the first year the program has expanded outside the city of San Diego. “Christmas is a time when God showed His love for us, and we’re ready to show God’s love in the communities where we live and serve,” said Pastor Miles McPherson, founder of Rock Church. “That’s the purpose of the church.” Learn more at www.toys-for-joy.org. W. Bush, for troops in the Middle East, Bill Gaither’s Homecoming Tours and on specials aired on Comedy Central, Showtime and VH1. The church is located at 5055 Governor Drive. Learn more at www.fbcsd.com or call (858) 457-4827. MISSION VALLEY — Men with a Purpose, a networking ministry that stresses transparency and grace, will hold its monthly luncheon from noon to 1:30 p.m. Dec. 18 at the Doubletree Hotel. Neil Jeffrey, a former All-American quarterback at Baylor University and quarterback for the San Diego Chargers, will be the guest speaker. Jeffrey serves as a speaking/teaching minister at the 28,000-member Prestonwood Church in Dallas, Texas, where he has served for more than 25 years. He is the author of the new book “If I Can, Y-Y-You Can!” The group meets the third Thursday of every month. Tickets are $20, which includes free parking. January’s guest speaker will be Capt. Ludwikowski, executive director of the Cru Military Ministry. Reservations may be made by emailing dwight@cts.com or calling (619) 222-3688. POINT LOMA — Straight Up Praise, an evening of worship designed to usher in the holy days, will be held at 7 p.m. Dec. 6 at Rock Church. The free event features soul singer Marz JukeBox and the worship band, Hear & Fear. Straight Up Praise is a spirit-led worship ministry created to nurture the body of Christ through “local intimate gatherings where all are welcome to come and experience the unconditional love that Jesus has to offer, and to rest in the presence of God.” Learn more at www.facebook.com/ straightuppraise. hicle was bouncing and kids were extrawired by the time we got to school. Children all grow up way too fast, and in our family Jeff, Brandon and Kristin make us proud every day. They are strong, independently minded adults now, thank God. As I said at the wedding reception, the last time my daughter did exactly what I needed her to do (like “Get into bed and go to sleep, Peanut”) she was 3. As the evening moved on and it was time for the after dinner “Dad and Daughter Dance,” we couldn’t help it. While the unconventional Led Zeppelin song “Thank You” played, we began slowly and respectfully, then I think both of us suddenly heard all those other tunes in our minds, all at once. The music had sweet lyrics as we burst into a zany combination of every goofy choreography move we ever did in the family living room. Total “Spazz Dance” antics, puzzling to many, perfect as we saw it. A life medley. Then the song was drawing to a close as I whispered, “Put your feet on my feet and follow my lead, like we did when you were a little girl.” Ah, the memories. She was so little then, and now tall, slender and beautiful. And this time, our soundtrack was syncopated to my groans of “Ow, ouch.” Time flies. We get all get older. But the melodies always linger on. Larson is a longtime Southern California radio/television personality. His voice is heard on KPRZ 1210AM, and his weekday talkshow airs 6-9 a.m. on KCBQ 1170AM. He is also a news analyst on KUSI TV. Learn more at www.marklarson.com. the cost of the gift. When the desire to please is so compelling, wise purchases are often difficult to make, especially with last-minute shopping. Buying impulsively and emotionally may render a momentary thrill but it also can result in disappointment and guilt. It goes without saying that the nurturing of relationships and investing time in loved ones throughout the year outlasts any gift we could give seasonally … those purchases are often forgotten, discarded or even re-gifted. Here are some simple tips to help keep the Ho Ho Ho in your Christmas: Freeze your credit cards—literally. The best way to keep from overspending is to use cash. I have actually encouraged people to put their card in a jar of water and freeze it if they have a tendency to overspend. That way, if they need the card for a genuine emergency, they can always thaw out the card. The odds of taking a frozen card to the store are slim! Wait 24 hours before buying anything that costs more than a pre-established amount. During our first year of marriage, my husband and I decided on the following policy: if anything was more than the amount we had decided upon (and not in the budget), we wait 24 hours to assess its value. After the day passes, if the item still holds its appeal, we then purchase it purposefully rather than impulsively. More often than not we discover it really wasn’t that important to us. We still operate off of this principle. Be thankful for what you have. Generally speaking, if you are reading this article, you have far more than most of the world. There is no better cure for your Christmas woes than a grateful heart. Give charitably to someone in need. Consider a gift of service or a financial gift or maybe even adopting a family in need. There is nothing quite like giving sacrificially at this time of year. After all, isn’t this really the true spirit of Christmas? It is both a challenge to have little money and a challenge to have much. The person on a tight budget may struggle to even buy the basics at Christmas. The person with abundance may overspend without a thought to good stewardship. There are so many distractions that can keep our eyes off the greatest gift of Christmas. Wherever this season finds you, it is my hope that you will reflect on two things: • First, on the joy and privilege of buying and giving appropriately • Second, and most importantly, on the unfathomable gift of the babe in the manger As J. I. Packer so eloquently put it in his classic book, “Knowing God,” “the taking of manhood by the Son is set before us in a way which shows how we should set it before ourselves and ever view it—not simply as a marvel of nature, but rather as a wonder of grace.” Here’s ho-ho-hoping you have a blessed, grace-filled Christmas! Janice Thompson is a certified financial planner and co-founder/CEO of One Degree Advisors, Inc. A frequent speaker on financial topics and mentor for financial professionals, she also serves on the board of directors for Kingdom Advisors. Learn more at www. onedegreeadvisors.com. Advisory services offered through One Degree Advisors, Inc.SM Securities offered through Securities America, Inc., Member FINRA/SIPC. One Degree Advisors and Securities America are separate companies. less life. My son knew Jesus was perfect, but he had never pondered the part about Jesus obeying His parents. He was floored. Help your children understand that Jesus was God-Man—that that little baby literally had created the world. If that’s hard for you to understand, join the crowd. It’s hard for me, too. But it’s a wonderful reality. Peace on earth and at the dinner table “Help! I’ve fallen and I can’t get up!” You’ve seen the commercial for the life-saving medical device. Have you stumbled recently? Not a physical fall like the senior in the TV ad but a fall or departure from a goal, a commitment or a healthy behavior that you so want to have victory over? The holidays are upon us, and many of my patients are experiencing a surge of anxiety. Calorie overload, excessive temptations and a flurry of commitments that sends us rushing and doing rather than being and enjoying. Instead of experiencing the fullness of family and friends, we settle for surviving the holidays rather than “thriving” the holidays. What if peace on earth could begin at the dinner table? Imagine sailing through the next month of parties, dinners and festivities without worrying about what to eat, how much to eat and how to say no to the relatives who have their own tradition of wanting to stuff both you and the bird. Janice Baker, one of San Diego’s most respected registered dieticians and diabetes educators, recently spoke at our weekly support group. She offers Refreshed readers her clever tips and suggestions for healthful holiday eating. With more than 10 years experience in teaching and nutrition counseling, Janice empowers her patients by sharing new tools as well as the latest research in overcoming health challenges. to start with and return for seconds if you are truly still hungry. Consume water-based foods. Try reaching for “water-rich” heavy foods such as fruits and vegetables instead of chips and crackers. Any time you pair water and fiber it’s more filling and holds your hunger in check. Think small. Use smaller plates and select smaller servings. Enjoy each food item by chewing slowly and noticing the tastes and textures, but avoid excessive calorie intake. This way you won’t feel deprived and you’ll experience the variety of foods usually reserved for the holidays. Keep moving. Schedule exercise into your day. Don’t wait until the end of the holiday season. Exercise regulates your appetite and keeps you on track. Drink water before dining. Water helps reduce your appetite. It creates a sense of fullness so you are less likely to over-indulge. (Alcohol is an appetite stimulant and is also full of calories.) Limit party drinks. One cup of eggnog equals 350 calories. That’s like drinking ice cream! One cup of punch is about 150 calories. if it took hours to prepare a special holiday dish. You can take home leftovers to savor the next day. • You have the right to eat pumpkin pie for breakfast! Consider these two simple healthprovoking questions as we approach the New Year: If you could paint a mental picture of a healthier, happier you, what would it look like? And what are three things you can do right now to get you closer to that new you? One of my patients said it best when she told me the first two letters in the word goal are “go,” which means we need to take action and put forth the effort. Remember, in pursuing new, healthier habits this coming year we are never alone. This is wonderful news! We always have an advocate. Psalm 43:8 gives us this assurance; “The Lord will command His loving kindness in the daytime; And His song will be with me in the night, a prayer to the God of my life.” Wishing you peace, perseverance and wonderful Christmas memories. Please feel free to email me if you have and questions or comments on health-related topics to: kim@ucprx. com. Kimberly Ruby, certified nutritionist at University Compounding Pharmacy, has been in the wellness industry for more than 20 years. She has been facilitating one of the longest running weight management support groups in the nation, meeting weekly in the North County for 10 years. Her health segments have appeared on local news channels. YOUR COMPLETE â&#x20AC;&#x153;One of San Diego PLUMBING Countyâ&#x20AC;&#x2122;s Best Equipped SERVICE and Most Experienced Leak Detectorsâ&#x20AC;? WE TEACH SKIN CARE All basic skin care products are non-comedogenic and clinically tested for skin irritancy and allergy. GET RELIEF FROM CREDITORS NOW!! 10% referral for buyers and sellers to your church or ministry. The right homeâ&#x20AC;Ś with the right Price. on n the box. he last box “Thanks, Mom,” I said. “This was the perfect gift.” And I meant it. I suppose that it’s probably time to make a wish list for this Christmas, but there isn’t really anything I need. I already have more stuff than I know what to do with and I’m actually all set for office supplies. Besides, Christmas is about more than what Santa leaves under the fir tree. It’s remembering the perfect gift that arrived more than 2,000 years ago, wrapped in swaddling clothes and tucked into a manger under a starry Bethlehem sky. Thirty-three years later, it was given again, wrapped this time in a crown of thorns and nailed on a wooden cross at Calvary. When it comes to presents, everything else pretty much pales in comparison. Award-winning freelance writer Joanne Brokaw spends her days dreaming of things she’d like to do but probably never will— like swimming with dolphins, cleaning the attic and someday overcoming the trauma of elementary school picture day. She lives with two dogs, a cat, six chickens and one very patient husband. Learn more at www.joannebrokaw.com. help you. Comprised of licensed and pre-licensed psychotherapists, including marriage family therapists, psychologists, and licensed professional clinical counselors. Thinking for Tomorrow, Today Finances are complexâ&#x20AC;&#x201D;and so is your life! Knowing where you are going and understanding how to get there can be challenging. Wealth management should go beyond what you have, and embrace what you want to accomplish. It starts with asking the right questions. Just as a carefully calibrated GPS can help you land accurately at almost any intended destination, a carefully calibrated ďŹ nancial plan can help you pursue your intended goals.